The analysis we have been conducting regarding the US and global markets shows one very interesting component that many people are overlooking – the pricing pressure in precious metals. Our research team at Technical Traders Ltd. has attempted to understand and this pricing pressure in relation to the strong international demand exhibited by China, India, Russia, and others. 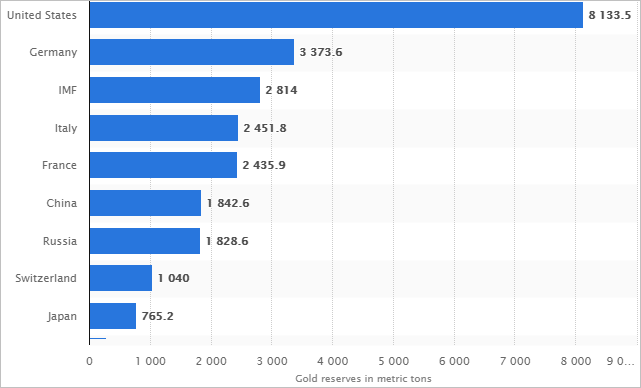 The below chart showing top gold reserves being accumulated by countries. The United States holds the largest gold reserve of any country on the planet. Yet, China, India, and Russia have all been increasing their reserves dramatically over the past few years. We believe this is a move to support their currencies and economies by moving away from fiat currency and preparing for an eventual massive price advance in precious metals. Comparatively, the Gold to Silver ratio is indicating that it would take nearly 79.66 ounces of Silver to equal 1 ounce of Gold (in terms of price comparison). This level typically indicates that Silver is dramatically undervalued compared to Gold. Yet, as we believe the price of Gold is about to launch to new highs and potentially push much higher into the future, this would indicate that opportunities for investment in either Gold or Silver could be substantial. Should a similar disparity in price advance occur as it did in 2009~2010 moving from near 80 to near or below 50, then the price advance in Silver will become dramatically more pronounced. We believe this type of move will likely become more evident as any greater market crisis event becomes more visible to global investors. In other words, there is a massive opportunity right now for strategic investments in physical precious metals as well as select equities that correlate to these potential moves. 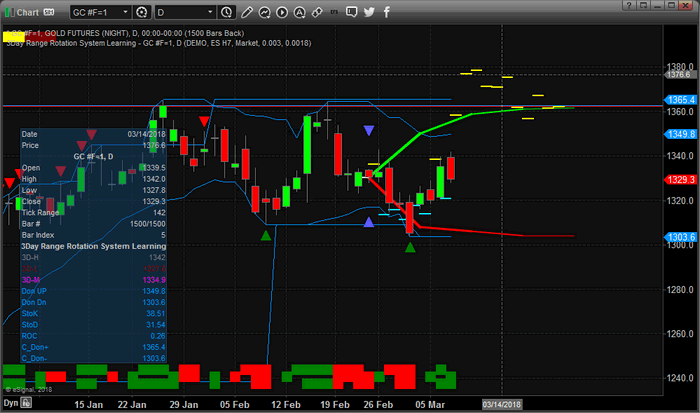 Just recently, we profited 20% from the gold miner’s pullback taking advantage of our downward prediction. Now, we are looking at what could be the beginning of a new bullish leg upwards. Our predictive modeling system is showing a very strong likelihood that Gold will rally to near $1380 within just a few weeks and continue to rotate near this level for a period of many weeks. This move, establishing a new recent high price level as well as potentially prompting a rising fear level in global investors may prompt a disparity in the Gold to Silver price ration resulting in a much more dramatic price advance in Silver. Investors should prepare for a moderately strong price advance in the precious metals that may be associated with a US Dollar price decline as well as a moderate price advance in certain commodities. Now is the time to think about how you can profit from these moves and the potential disparity in the Gold/Silver price ratio. We share our analysis so that you have some real predictive analysis data to research and review. We are not always 100% accurate in our pricing or timing modeling systems predictions, but you can spend a little time reading our research reports through most of this year to see how we’ve been calling these market moves since well before the start of 2018. Visit www.TheTechnicalTraders.com to see what we offer our subscribers and learn how we can assist you in finding great trading opportunities. In fact, pay attention to the market moves as they play out over the next few weeks to see how accurate our research really is. We’re confident you will quickly understand that we provide some of the best predictive analysis you can find and we are proud to offer our clients this type of research. In closing, don’t fall for the fear and panic articles. Yes, the market is extended. Yes, the market may correct sometime in the future. Yes, the Fed has likely created a massive bubble. But it’s not over yet and the real trade is this 80%+ rally that is setting up in Silver while Gold is setting up for a 10~20% rally. Hope to see you in our member’s area where we can share more data and research to help you profit from these moves – visit www.TheTechnicalTraders.com to learn more.